I’m looking for a 14 inch quilted square aqua, green, and cream velour blankie. 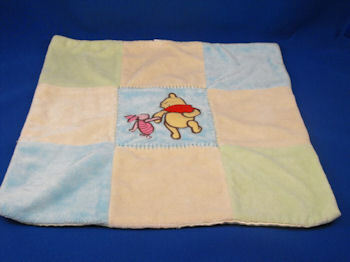 It has WINNIE the POOH and PIGLET Embroidered in the center, and it has a cream satin lining. I don’t know what brand it is. Ebay # 150540812309 new with tags. Ebay # 140586577269 new with tags 2 available lower price. Hope this helps if your still searching. Have you found your blanket? Let us know. Lots of options if you are still searching. Let us know.